سالاری, مسعود, شریعت, سید محمود, رحیمی, راضیه, دشتی, سولماز. (1397). ارزیابی توان سرزمین به منظور استقرار کاربری شهرک صنعتی با استفاده از روش تصمیم گیری چند معیاره و AHP (مطالعه موردی: جزیره قشم). 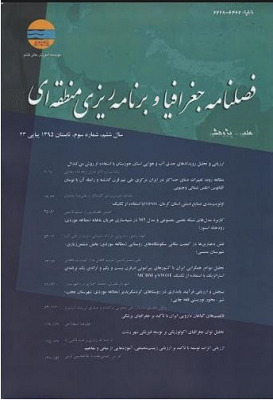 فصلنامه جغرافیا ( برنامه ریزی منطقه ای), 31(2), 303-315. مسعود سالاری; سید محمود شریعت; راضیه رحیمی; سولماز دشتی. "ارزیابی توان سرزمین به منظور استقرار کاربری شهرک صنعتی با استفاده از روش تصمیم گیری چند معیاره و AHP (مطالعه موردی: جزیره قشم)". فصلنامه جغرافیا ( برنامه ریزی منطقه ای), 31, 2, 1397, 303-315. سالاری, مسعود, شریعت, سید محمود, رحیمی, راضیه, دشتی, سولماز. (1397). 'ارزیابی توان سرزمین به منظور استقرار کاربری شهرک صنعتی با استفاده از روش تصمیم گیری چند معیاره و AHP (مطالعه موردی: جزیره قشم)', فصلنامه جغرافیا ( برنامه ریزی منطقه ای), 31(2), pp. 303-315. سالاری, مسعود, شریعت, سید محمود, رحیمی, راضیه, دشتی, سولماز. ارزیابی توان سرزمین به منظور استقرار کاربری شهرک صنعتی با استفاده از روش تصمیم گیری چند معیاره و AHP (مطالعه موردی: جزیره قشم). فصلنامه جغرافیا ( برنامه ریزی منطقه ای), 1397; 31(2): 303-315. شناسایی ظرفیت‌های توسعه صنعتی در هر کشوری جزء الویت های انکارناپذیر می‌باشد. بدیهی است استفاده از روشهای کمی و کاهش دخالت کارشناسی در فرایند تصمیم گیری و ارزیابی می‌تواند نتایج بهتری ارائه کند. لذا در این تحقیق به منظور ارزیابی جزیره قشم برای توسعه شهرکهای صنعتی از روش ارزیابی چند معیاره (MCDM) مبتنی بر منطق فازی و فرایند تحلیل سلسه مراتبی (AHP) استفاده شده است. در این پژوهش معیارهای مؤثر بر تعیین مکان مناسب جهت احداث شهرکهای صنعتی شامل پارامترهای اکولوژیکی و اقتصادی اجتماعی می‌باشند که به روش دلفی شناسایی شدند. جهت انجام تحقیق ابتدا لایه‌های رقومی و داده‌های مورد نیاز از پایگاه‌های اطلاعاتی و برداشت‌های میدانی در منطقه مورد مطالعه تهیه شدند و معیارها و شاخص‌ها به روش فازی کمی و نرمال گردید. همچنین وزن عوامل با فرایند تحلیل سلسله مراتبی تعیین گردید. سپس با استفاده از روش ترکیب خطی وزنی کلیه لایه‌های اطلاعاتی در سیستم اطلاعات جغرافیایی تلفیق شده و نقشه نهایی مکانیابی شهرک‌های صنعتی تهیه گردید. نتایج نشان داد پارامترهای اقتصادی و اجتماعی با وزن 6/0 بیشترین تأثیر را در مکانیابی شهرک‌های صنعتی منطقه دارد و شاخص کاربری اراضی با وزن 24/0 (از بین معیارهای اقتصادی اجتماعی) و شاخص گسل با وزن 13/0 (از بین معیارهای اکولوژیکی) از مهم‌ترین شاخصها در مکانیابی شهرک‌های صنعتی در منطقه می‌باشند. Identifying industrial development capacities in any country is an indisputable priority. Obviously, using quantitative methods and reducing the involvement of the bachelor in the decision making process can provide better results. Therefore, in order to evaluate Qeshm Island for the development of industrial settlements, Multi-criteria Evaluation Method (MCDM) based on Fuzzy logic and Analytical Hierarchy Process (AHP) has been used. In this research, the effective criteria for determining the suitable location for the construction of industrial zones include ecological and socioeconomic parameters that were identified by Delphi method. In order to carry out the research, digital layers and required data were obtained from the databases and field observations in the study area and the criteria and indices were quantitated and normalized by fuzzy method. The weight of factors was also determined by Analytical Hierarchy Process. Then, by using the weighted linear combination (WLC), all information layers were integrated in the GIS and the final map of the location of industrial zones was prepared. The results showed that the ocioeconomic parameters with the weight of 0.6 have the most effect on locating the industrial zones in the area, and the land use index with weight of 0.24 (among the socioeconomic criteria) and the index of the fault with weight of 0.13 (among the ecological criteria) Are the most important indicators in locating industrial zones in the region. رضویان، محمد تقی (1381). برنامه ریزی کاربری اراضی شهری، نشر منشی. شیری، ک (1380). بکارگیری مدل‌ها در مکان یابی شهرک‌های صنعتی، نمونه موردی: شهرستان گچساران، دانشگاه شهید بهشتی. فرهنگ دره شوری، ب (1388). طبیعت قشم، چاپ اول، انتشارات آگاه، 156 صفحه. Barzekar G, Aziz A, Mariapan M, Ismail MH, Hosseni SM. )2011(. Delphi technique for generating criteria and indicators in monitoring ecotourism sustainability in Northern forests of Iran; case study on Dohezar and Sehezar Watersheds. Folia ForestaliaPolonica Series, 53(2): 130-141. Caloz R. and Collet, C. Analyse spatiale de l’information géographique, Presse polytechniques et universitaires romandes, 2011. Chakhar, S., “Cartographie Décisionnelle Multicritère: Formalisation Et Implémentation Informatique ”, Thèse de doctorat, D.F.R. Sciences des Organisations, Université Paris Dauphine, France,2006. Chung, S., A.H.I. Lee, and W.L Pearn, (2005): Analytic network process ANP approach for product mix planning in semiconductor fabricator. Int. J. Production Economics, 96, pp: 15-36.
location.” Journal of International Economics, Vol. 57, PP. 273–97. Ghoddousi J. 2014. Application of MCDM techniques in HSE and Environment management. Lecture note (In Persian). IAU. Science and Research Branch, Tehran. College of Environment and Energy. Keeney, R.L. Siting Energy Facilities. New York: Academic Press, 1980. Khalid, E., “Exploring multi-criteria decision strategies in GIS with linguistic quantifiers: An extension of the Analytical Network Process using Ordered Weighted Averaging operators”, International Journal of Geographical Information Science, 815356, 2013. Malczewski, J. Rinner, C. “Exploring multicriteria decision strategies in GIS with linguistic quantifiers: A case study of residential quality evaluation,” Journal of Geographic Systems 7, pp. 249–268, 2005. Massachusetts University, (2006), “Industrial Park Site Assessment Analysis for the Franklin Regional Council of Governments Franklin County, Massachusetts”, Massachusetts: University of Massachusetts, Amherst Department of Landscape Architecture and Regional Planningo. Mirata M. and Emtairah, T. (2005). “Industrial symbiosis networks and the contribution to environmental innovation: the case of the Landskrona industrial symbiosis programme.” Journal of Cleaner Production, Vol.13, PP. 993–1002. Ruiz, M.C., E. Romero, M.A. Perez, andJ. Fernandez, (2011) Development and Application of a Multi- Criteria Spatial Decision Support System Planning Sustainable Industrial area in Northern Spain, Automation in Construction, 22, pp: 320-333. Saaty, T. L. “Decision making with the analytic hierarchy process”, Int. J. Services Sciences, Vol. 1, No. 1, PP.83-98, 2008. Vahidniaa, M.H. Alesheikhb, A. Alimohammadic A.and Bassirid, A. “A Fuzzy Analytical Hierarchy Process in GIS Application”, the International Archives of the Photogrammetry, Remote Sensing and Spatial Information Sciences. Vol.37.part B2. Beijing, 2008. Wang, Y.-M. Luo Y.and Hua, Z. “On the extent analysis method for fuzzy AHP and its applications”, European Journal of Operational Research, PP.735–747, 2008.